Despite retiring two years ago after a long and illustrious career, 40-year-old Jose Luis Chilavert still finds himself very much in the limelight, not least because the legendary figure is now starring in a football reality show on American television. Yes, you read it correctly. The player many regarded as the bad boy of South American football now travels the continent selecting players to participate in a sporting project for a US TV show. "It's an interesting project and, like everything the North Americans do, very well organised. It allows me to maintain my ties with the game and raise my profile at the same time," he tells FIFAworldcup.com from Buenos Aires as he prepares to return to Miami. However, television is far from the only business interest for the man who first put goalscoring keepers on the map. Chilavert has a large property portfolio, owns a themed restaurant in Asuncion and is a partner in an ophthalmology clinic. "After I retired, I decided to take a sabbatical and spend more time with my family. My wife jokingly tells me I must be the only retired footballer who doesn't miss the game. In fact, I believe it's the world of football that misses me. There are no heavyweights these days," he says with a broad smile. However, the former captain of the Albirroja has just the solution. "After the World Cup, I'd like to become coach of Paraguay. Why not? I believe I have a lot of experience to bring to the team," he says in his own inimitable style without so much as blinking. So how would his side play? "Four-four-two is currently in vogue in world football, although I would have a couple of very mobile wingers making space with diagonal runs. True to my style, the team would be aggressive from the very first minute and have a winning mentality." Chilavert's career rise was nothing short of meteoric. He began playing professional football with Paraguay's Sportivo Luqueno at just 15 before moving to another of his country's sides, Guarani, a few seasons later. In 1985 at the age of 20 he left his homeland to try his luck in Argentine football with San Lorenzo. Four years later he moved to Spain's Real Zaragoza, where he played until returning to South America to star for Velez Sarsfield. It was there between 1992 and 2000 that he helped write the most glorious chapter in the history of the club, winning, among other things, the Argentinian championship, the Copa Libertadores, the Intercontinental (Toyota) Cup and the South American Supercup. "I'm still given a hero's welcome whenever I return to the club. That's the beauty of football: I can relive my career every time I go there," he says emotionally. In the latter years of his playing career, Chilavert had spells at French side Strasbourg and Penarol of Montevideo before enjoying an inevitable swansong with Velez Sarsfield. For all of that, nothing gave the extroverted goalkeeper as much enjoyment as playing for his country, whom he represented at successive FIFA World Cups™. At the first of these, France 98, Paraguay's hopes were cruelly dashed by a Laurent Blanc golden goal for the hosts and eventual winners after the Albirroja had pushed them all the way. "I remember seeing many French fans leaving the stadium near the end. They couldn't bear the thought of watching a penalty shoot-out. If it had have come to that, I believe we would have gone through. I thought a place in the final might even be possible that year, but unfortunately fate dealt us a very different hand," he laments. 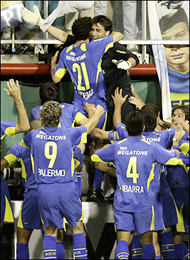 The memorable image of Chilavert picking up his inconsolable team-mates after the final whistle was one that was beamed around the world. "Despite what happened, Paraguay gained recognition the world over as a tough side, and that was all down to the efforts of that group," recalls the man voted best goalkeeper of that FIFA World Cup. Four years later at Korea/Japan 2002, Chilavert and Co crashed out against another eventual finalist, Germany, again at the last-16 stage. "Once again we were undone by a late goal, but that's football for you. Playing at a World Cup is the ultimate for a professional, and I believe that the 2006 finals will be even better. Germany's organisation and infrastructure are marvellous," says Chilavert, who is still grateful for all the possibilities the game has given him. "Just to give you one example. The last World Cup allowed me to get to know the Korean islands, which I would never otherwise have visited. All of that is thanks to football." Despite not having won the FIFA World Cup, Chilavert realises that the chance to measure himself against the finest players in the game at the world's premier tournament was a unique experience. "Playing in that competition is akin to taking a kid from a very poor neighbourhood to Disneyland. It's a once-in-a-lifetime opportunity for many players, not only to taste glory, but also to make a name for themselves on the world stage," he explains. Nevertheless, the former goalkeeper's gratitude for everything the tournament gave him cannot mask his unfulfilled ambitions. "I've won it all at club level, but in truth I'd swap everything to have won a world title with Paraguay. I'd gladly hand over half, no, make that all, of what I've accumulated. I was part of a historic win for a modest Velez side against the mighty Milan, but becoming world champions, that's not something that happens every day." It will happen next year, however, as 32 teams including the Albirroja go in search of the world title that eluded Chilavert during his playing career. So how does Paraguay's most famous player think the current side will fare? "That depends on how they do in their opening game (against England). Much will also depend on what kind of shape some of the players are in physically, and whether or not they have natural replacements, especially for the older players." And how does he feel his successor Justo Villar is doing? "He's a very good goalkeeper. I like him because he's very fast on his feet, although his lack of height could work against him," says Chilavert, who will be urging his compatriots on in his role as a TV commentator. After that the Paraguayan will begin seeking his opportunity in coaching, a role he knows awaits him sooner or later. Playing career: Sportivo Luqueno, Guarani (Paraguay), San Lorenzo de Almagro (Argentina), Real Zaragoza (Spain), Velez Sarsfield (Argentina), Racing Club Strasbourg (France), Penarol (Uruguay), Velez Sarsfield.